Munich (; German: München, [ˈmʏnçn̩], Bavarian: Minga [ˈmɪŋ(ː)ɐ], Czech: Mnichov) is the capital and the most populated city in the German state of Bavaria, on the banks of River Isar north of the Bavarian Alps. Munich is also the third largest city in Germany, after Berlin and Hamburg, and the 12th biggest city of the European Union, with a population of around 1.5 million. The Munich Metropolitan Region is home to 6 million people. The city is a major centre of art, advanced technologies, finance, publishing, culture, innovation, education, business, and tourism in Germany and Europe and enjoys a very high standard and quality of living, reaching first in Germany and fourth worldwide according to the 2015 Mercer survey. According to the Globalization and World Rankings Research Institute Munich is considered an alpha-world city, as of 2015. The name of the city is derived from the Old/Middle High German term Munichen, meaning "by the monks", which in turn is derived from Mönch (which in the end derives from ancient Greek μοναχός). It derives from the monks of the Benedictine order, who ran a monastery at the place that was later to become the Old Town of Munich; hence the monk depicted on the city's coat of arms. Munich was first mentioned in 1158. From 1255 the city was seat of the Bavarian Dukes. Black and gold – the colours of the Holy Roman Empire – have been the city's official colours since the time of Ludwig the Bavarian, when it was an imperial residence. Following a final reunification of the Wittelsbachian Duchy of Bavaria, previously divided and sub-divided for more than 200 years, the town became the country's sole capital in 1506. Catholic Munich was a cultural stronghold of the Counter-Reformation and a political point of divergence during the resulting Thirty Years' War, but remained physically untouched despite an occupation by the Protestant Swedes; as the townsfolk would rather open the gates of their town than risk siege and almost inevitable destruction. Like wide parts of the Holy Roman Empire, the area recovered slowly economically. Having evolved from a duchy's capital into that of an electorate (1623), and later a sovereign kingdom (1806), Munich has been a major European centre of arts, architecture, culture and science since the early 19th century, heavily sponsored by the Bavarian monarchs. 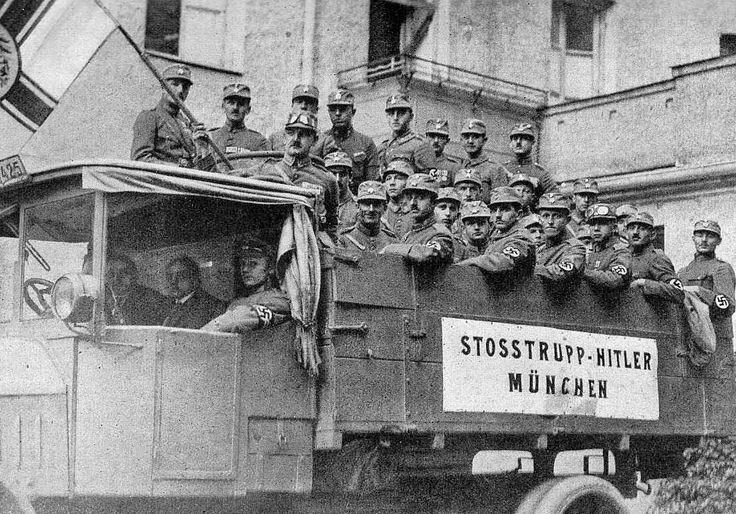 In 1918, during the German Revolution, the ruling house of Wittelsbach, which governed Bavaria since 1180, was forced to abdicate in Munich and a short-lived socialist republic was declared. In the 1920s, Munich became home to several political factions, among them the NSDAP, which was founded in the city in 1920. Though the first attempt of the Nazi movement to take over the German government in 1923 with the Beer Hall Putsch, which was stopped by the Bavarian police in Munich with gunfire, the Nazis declared the city after their rise to power to be Hauptstadt der Bewegung (lit. : "Capital of the movement"). During World War II, Munich was heavily bombed and more than 50% of the entire city and up to 90% of the historic centre were destroyed. The postwar period until 1949 was characterised by American occupation; after 1949, there was a great increase in population and economic power during the years of Wirtschaftswunder (lit. : "economic miracle"). Unlike many other German cities which were heavily bombed and destroyed during World War II, Munich rebuilt most of its traditional cityscape and added a modern face with the Olympic Stadium, while hosting the 1972 Summer Olympics. Especially since the 1980s, Munich and the surrounding region were characterised by strong economic growth, high-tech industries and scientific institutions, very low unemployment rates and a strong influx of people. The city is home to major corporations like BMW, Siemens, MAN, Linde, Allianz and MunichRE, as well as many small and medium-sized companies. Munich is home to many national and international authorities, major universities, major museums and theatres. 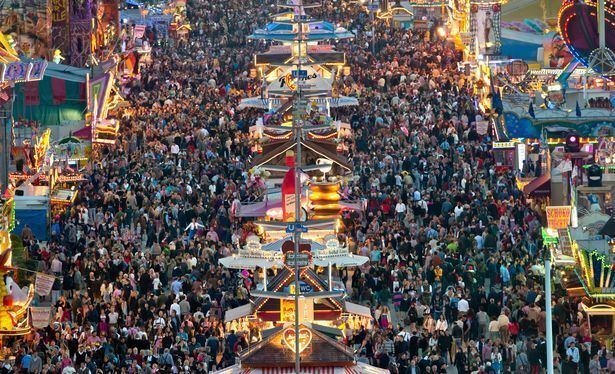 Its numerous architectural attractions, international sports events, exhibitions and conferences and its annual Oktoberfest attract considerable tourism. Munich is one of the most prosperous and fastest growing cities in Germany. It is a top-ranked destination for migration and expatriate location, despite being the municipality with the highest population density in Germany (4,500 people per km²) . Munich hosts more than 530,000 people of foreign background, making up 37.7% of its population. The first known settlement in the area was of Benedictine monks on the Old Salt Route. The foundation date is considered the year 1158, the date the city was first mentioned in a document. The document was signed in Augsburg. By then, the Guelph Henry the Lion, Duke of Saxony and Bavaria, had built a toll bridge over the river Isar next to the monk settlement and on the salt route. In 1175, Munich received city status and fortification. In 1180, with the trial of Henry the Lion, Otto I Wittelsbach became Duke of Bavaria, and Munich was handed to the Bishop of Freising. (Wittelsbach's heirs, the Wittelsbach dynasty, ruled Bavaria until 1918.) In 1240, Munich was transferred to Otto II Wittelsbach and in 1255, when the Duchy of Bavaria was split in two, Munich became the ducal residence of Upper Bavaria. When Bavaria was reunited in 1506, Munich became its capital. The arts and politics became increasingly influenced by the court (see Orlando di Lasso, Heinrich Schütz and later Mozart and Richard Wagner). During the 16th century, Munich was a centre of the German counter reformation, and also of renaissance arts. Duke Wilhelm V commissioned the Jesuit Michaelskirche, which became a centre for the counter-reformation, and also built the Hofbräuhaus for brewing brown beer in 1589. The Catholic League was founded in Munich in 1609. In 1806, the city became the capital of the new Kingdom of Bavaria, with the state's parliament (the Landtag) and the new archdiocese of Munich and Freising being located in the city. Twenty years later, Landshut University was moved to Munich. Many of the city's finest buildings belong to this period and were built under the first three Bavarian kings. Especially Ludwig I rendered outstanding services to Munich's status as a centre of the arts, attracting numerous artists and enhancing the city's architectural substance with grand boulevards and buildings. On the other hand, Ludwig II, famous the world over as the fairytale king, was mostly aloof from his capital and focused more on his fanciful castles in the Bavarian countryside. Nevertheless, his patronage of Richard Wagner secured his posthumous reputation, as do his castles, which generate significant tourist income for Bavaria to this day. Later, Prince Regent Luitpold's years as regent were marked by tremendous artistic and cultural activity in Munich, enhancing its status as a cultural force of global importance (see Franz von Stuck and Der Blaue Reiter). After World War I, the city was at the centre of much political unrest. In November 1918 on the eve of German revolution, Ludwig III and his family fled the city. After the murder of the first republican premier of Bavaria Kurt Eisner in February 1919 by Anton Graf von Arco auf Valley, the Bavarian Soviet Republic was proclaimed. When Communists took power, Lenin, who had lived in Munich some years before, sent a congratulatory telegram, but the Soviet Republic was put down on 3 May 1919 by the Freikorps. While the republican government had been restored, Munich became a hotbed of extremist politics, among which Adolf Hitler and the National Socialists rose to prominence. In 1923, Adolf Hitler and his supporters, who were concentrated in Munich, staged the Beer Hall Putsch, an attempt to overthrow the Weimar Republic and seize power. The revolt failed, resulting in Hitler's arrest and the temporary crippling of the Nazi Party (NSDAP), which was virtually unknown outside Munich. The city again became a Nazi stronghold when the party took power in Germany in 1933. The party created its first concentration camp at Dachau, 16 kilometres (9.9 miles) north-west of the city. Because of its importance to the rise of National Socialism, Munich was referred to as the Hauptstadt der Bewegung ("Capital of the Movement"). The NSDAP headquarters were in Munich and many Führerbauten ("Führer-buildings") were built around the Königsplatz, some of which still survive. The city was heavily damaged by allied bombing during World War II – it was hit by 71 air raids during five years. After US occupation in 1945, Munich was completely rebuilt following a meticulous and – by comparison to other war-ravaged West German cities – rather conservative plan which preserved its pre-war street grid. In 1957, Munich's population surpassed 1 million. The city continued to play a highly significant role in the German economy, politics and culture, giving rise to its nickname Heimliche Hauptstadt ("secret capital") in the decades after World War II. Most Munich residents enjoy a high quality of life. Mercer HR Consulting consistently rates the city among the top 10 cities with the highest quality of life worldwide – a 2011 survey ranked Munich as 4th. The same company also ranks Munich as the 39th most expensive in the world and city most expensive major city in Germany. Munich enjoys a thriving economy, driven by the information technology, biotechnology, and publishing sectors. Environmental pollution is low, although as of 2006 the city council is concerned about levels of particulate matter (PM), especially along the city's major thoroughfares. Since the enactment of EU legislation concerning the concentration of particulate in the air, environmental groups such as Greenpeace have staged large protest rallies to urge the city council and the State government to take a harder stance on pollution. Today, the crime rate is low compared with other large German cities, such as Hamburg or Berlin. For its high quality of life and safety, the city has been nicknamed "Toytown" among the English-speaking residents. German inhabitants call it "Millionendorf", an expression which means "village of a million people". Due to the high standard of living in and the thriving economy of the city and the region, there was an influx of people and Munich's population surpassed 1.5 million by June 2015, an increase of more than 20% in 10 years. At Munich's official weather station, the highest and lowest temperatures ever measured are 37 °C (99 °F), on 13 August 2003, and −31.6 °C (−24.9 °F), on 12 February 1929. In July 2017, Munich had 1.42 million inhabitants; 300,129 of those did not have German citizenship. The city has strong Turkish and Balkan communities. The largest groups of foreign nationals were Turks (43,309), Albanians (30,385), Croats (24,866), Serbs (24,439), Greeks (22,486), Austrians (21,411), and Italians (20,847). 37% of foreign nationals come from the European Union. About 45% of Munich's residents are not affiliated with any religious group, and this ratio represents the fastest growing segment of the population. As in the rest of Germany, the Roman Catholic and Protestant churches have experienced a continuous decline in membership. As of 31 December 2016, 32.4% of the city's inhabitants were Roman Catholic, 11.6% Protestant and 0.3% Jewish. In 2011, 7.5% were Muslim migrants from 21 countries of origin. About 3% adhere to other Christian denominations. There is also a small Old Catholic parish and an English-speaking parish of the Episcopal Church in the city. Munich's current mayor is Dieter Reiter of the Social Democratic Party of Germany. Munich has been governed by the SPD for all but six years since 1948. This is remarkable because Bavaria – and particularly southern Bavaria – has long been a conservative stronghold, with the Christian Social Union winning absolute majorities among the Bavarian electorate in many elections at the communal, state, and federal levels, and leading the Bavarian state government for all but three years since 1946. Bavaria's second most populous city, Nuremberg, is also one of the very few Bavarian cities governed by a SPD-led coalition. The Frauenkirche is the most famous building in the city centre and serves as the cathedral for the Archdiocese of Munich and Freising. The nearby Michaelskirche is the largest renaissance church north of the Alps, while the Theatinerkirche is a basilica in Italianate high baroque, which had a major influence on Southern German baroque architecture. Its dome dominates the Odeonsplatz. Other baroque churches in the inner city which are worth a detour are the Bürgersaalkirche, the Dreifaltigkeitskirche, the St. Anna Damenstiftskirche and St. Anna im Lehel, the first rococo church in Bavaria. The Asamkirche was endowed and built by the Brothers Asam, pioneering artists of the rococo period. Lehel, a bourgeoise quarter east of the Altstadt, is characterised by countless well-preserved (and in parts excellently reconstructed) town houses, giving a thorough impression of the "old Munich" outside of the main tourist routes. St. Lukas is the largest Protestant Church in Munich. Ludwigstrasse also begins at Odeonsplatz and runs from south to north, skirting the Ludwig-Maximilians-Universität, the St. Louis church, the Bavarian State Library and numerous state ministries and palaces. The southern part of the avenue was constructed in Italian renaissance style, while the north is strongly influenced by Italian Romanesque architecture. The Siegestor (gate of victory) sits at the northern end of Ludwigstraße, where the latter passes over into Leopoldstraße and the district of Schwabing begins. The neo-Gothic Maximilianstraße starts at Max-Joseph-Platz, where the Residenz and the National Theatre are situated, and runs from west to east. The avenue is framed by elaborately structured neo-Gothic buildings which house, among others, the Schauspielhaus, the Building of the district government of Upper Bavaria and the Museum of Ethnology. After crossing the river Isar, the avenue circles the Maximilianeum, home of the state parliament. The western portion of Maximilianstraße is known for its designer shops, luxury boutiques, jewellery stores, and one of Munich's foremost five-star hotels, the Hotel Vier Jahreszeiten. Prinzregentenstrasse runs parallel to Maximilianstraße and begins at Prinz-Carl-Palais. Many museums can be found along the avenue, such as the Haus der Kunst, the Bavarian National Museum and the Schackgalerie. The avenue crosses the Isar and circles the Friedensengel monument, then passing the Villa Stuck and Hitler's old apartment. The Prinzregententheater is at Prinzregentenplatz further to the east. Two large baroque palaces in Nymphenburg and Oberschleissheim are reminders of Bavaria's royal past. Schloss Nymphenburg (Nymphenburg Palace), some 6 km (4 mi) north west of the city centre, is surrounded by an impressive park and is considered to be one of Europe's most beautiful royal residences. 2 km (1 mi) northwest of Nymphenburg Palace is Schloss Blutenburg (Blutenburg Castle), an old ducal country seat with a late-Gothic palace church. Schloss Fürstenried (Fürstenried Palace), a baroque palace of similar structure to Nymphenburg but of much smaller size, was erected around the same time in the south west of Munich. The second large baroque residence is Schloss Schleissheim (Schleissheim Palace), located in the suburb of Oberschleissheim, a palace complex encompassing three separate residences: Altes Schloss Schleissheim (the old palace), Neues Schloss Schleissheim (the new palace) and Schloss Lustheim (Lustheim Palace). Most parts of the palace complex serve as museums and art galleries. Deutsches Museum's Flugwerft Schleissheim flight exhibition centre is located nearby, on the Schleissheim Special Landing Field. The Bavaria statue before the neo-classical Ruhmeshalle is a monumental, bronze sand-cast 19th-century statue at Theresienwiese. The Grünwald castle is the only medieval castle in the Munich area which still exists. St Michael in Berg am Laim might be the most remarkable church in the suburbs. Another church of Johann Michael Fischer is St George in Bogenhausen. Most of the boroughs have parish churches which originate from the Middle Ages like the most famous church of pilgrimage in Munich St Mary in Ramersdorf. The oldest church within the city borders is Heilig Kreuz in Fröttmaning next to the Allianz-Arena, known for its Romanesque fresco. Especially in its suburbs, Munich features a wide and diverse array of modern architecture, although strict culturally sensitive height limitations for buildings have limited the construction of skyscrapers to avoid a loss of views to the distant Bavarian Alps. Most high-rise buildings are clustered at the northern edge of Munich in the skyline, like the Hypo-Haus, the Arabella High-Rise Building, the Highlight Towers, Uptown Munich, Münchner Tor and the BMW Headquarters next to the Olympic Park. Several other high-rise buildings are located near the city centre and on the Siemens campus in southern Munich. A landmark of modern Munich is also the architecture of the sport stadiums (as described below). Munich is a densely-built city but still offers numerous public parks. The Englischer Garten, close to the city centre and covering an area of 3.7 km2 (1.4 sq mi) (larger than Central Park in New York), is one of the world's largest urban public parks. It contains a famous nudist area, numerous bicycle and jogging tracks as well as bridle-paths. It is considered the "green lung" of Munich and one of the city's best-loved features. It was designed and laid out by Benjamin Thompson, Count of Rumford, for both pleasure and as a work area for the city's vagrants and homeless. Nowadays it is entirely a park, its southern half being dominated by wide and extremely well-kept open areas, hills, monuments and beach-like stretches (along the streams Eisbach and Schwabinger Bach), which get crowded in summer. In contrast, its less-frequented northern part is much more quiet, idyllic and natural-seeming, at times resembling a natural preserve more than an urban public park: it has lots of old trees, thick undergrowth, winding streams, hidden meadows and is pervaded by numerous romantic pathways. Multiple Biergartens can be found in both parts of the Englischer Garten, the most well known being located at the Chinese Pagoda. Munich is home to several professional football teams including Bayern Munich, Germany's most successful club and a multiple UEFA Champions League winner. 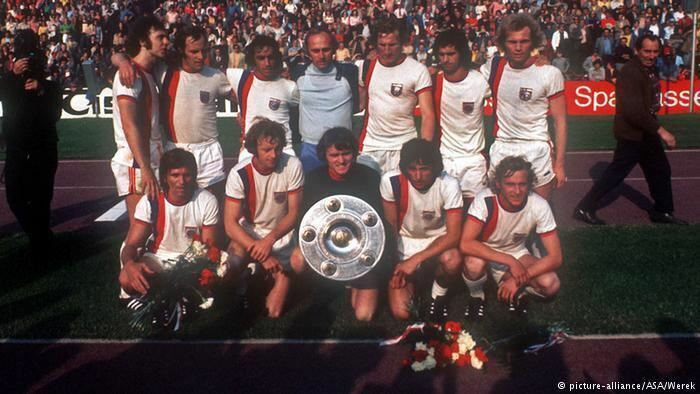 The Munich area currently has three clubs: Bayern Munich, 1860 Munich and SpVgg Unterhaching in the Bundesliga, 2. Bundesliga, and Regionalliga (4th league) respectively, which are the top four leagues in the German football league system. FC Bayern Munich Basketball currently playing in Beko Basket Bundesliga. The city hosted the final stages of the FIBA EuroBasket 1993, where the German national basketball team won the gold medal. Munich hosted the 1972 Summer Olympics, where the Munich Massacre took place. It was one of the host cities for the 2006 Football World Cup, which was not held in Munich's Olympic Stadium, but in a new football specific stadium, the Allianz Arena. Munich bid to host the 2018 Winter Olympic Games, but lost to Pyeongchang. In September 2011 the DOSB President Thomas Bach confirmed that Munich would bid again for the Winter Olympics in the future. There are three annual road running events in Munich, the Munich Marathon in October, the company run B2Run in July and the New Year's Run on 31 December. Public sporting facilities in Munich include ten indoor swimming pools and eight outdoor swimming pools, which are operated by the Munich City Utilities (SWM) communal company, while swimming within Munich's city limits is also possible in several artificial lakes such as for example the Riemer See or the Langwieder lake district. The Bavarian dialects are spoken in and around Munich, with its variety Upper Bavarian (Oberbayrisch). Austro-Bavarian has no official status by the Bavarian authorities or local government, yet is recognised by the SIL and has its own ISO-639 code. The city has several important art galleries, most of which can be found in the Kunstareal, including the Alte Pinakothek, the Neue Pinakothek, the Pinakothek der Moderne and the Museum Brandhorst. Alte Pinakothek's monolithic structure contains a treasure trove of the works of European masters between the 14th and 18th centuries. The collection reflects the eclectic tastes of the Wittelsbachs over four centuries, and is sorted by schools over two sprawling floors. Major displays include Albrecht Dürer's Christ-like Self-Portrait, his Four Apostles, Raphael's paintings The Canigiani Holy Family and Madonna Tempi as well as Peter Paul Rubens two-story-high Judgment Day. The gallery houses one of the world's most comprehensive Rubens collections. Before World War I, the Blaue Reiter group of artists worked in Munich. Many of their works can now be seen at the Lenbachhaus. Another area for the arts next to the Kunstareal is the Lehel quarter between the old town and the river Isar: the Museum Five Continents in Maximilianstraße is the second largest collection in Germany of artefacts and objects from outside Europe, while the Bavarian National Museum and the adjoining Bavarian State Archaeological Collection in Prinzregentenstrasse rank among Europe's major art and cultural history museums. The nearby Schackgalerie is an important gallery of German 19th-century paintings. Munich is a major European cultural centre and has played host to many prominent composers including Orlando di Lasso, W.A. Mozart, Carl Maria von Weber, Richard Wagner, Gustav Mahler, Richard Strauss, Max Reger and Carl Orff. With the Munich Biennale founded by Hans Werner Henze, and the A*DEvantgarde festival, the city still contributes to modern music theatre. Some of classical music's best-known pieces have been created in and around Munich by native composers, for example Richard Strauss's famous tone poem Also sprach Zarathustra or Carl Orff's Carmina Burana. The Nationaltheater, where several of Richard Wagner's operas had their premieres under the patronage of Ludwig II of Bavaria, is the home of the Bavarian State Opera and the Bavarian State Orchestra. Next door, the modern Residenz Theatre was erected in the building that had housed the Cuvilliés Theatre before World War II. Many operas were staged there, including the premiere of Mozart's Idomeneo in 1781. The Gärtnerplatz Theatre is a ballet and musical state theatre while another opera house, the Prinzregententheater, has become the home of the Bavarian Theatre Academy. Munich's contributions to modern popular music are often overlooked in favour of its strong association with classical music, but they are numerous: the city has had a strong music scene in the 1960s and 1970s, with many internationally renowned bands and musicians frequently performing in its clubs. Furthermore, Munich was the centre of Krautrock in southern Germany, with many important bands such as Amon Düül II, Embryo or Popol Vuh hailing from the city. In the 1970s, the Musicland Studios developed into one of the most prominent recording studios in the world, with famous bands such as the Rolling Stones, Led Zeppelin, Deep Purple and Queen recording albums there. Munich also played a significant role in the development of electronic music, with genre pioneer Giorgio Moroder, who invented synth disco and electronic dance music, and Donna Summer, one of disco music's most important performers, both living and working in the city. In the late 1990s, Electroclash was substantially co-invented if not even invented in Munich, when DJ Hell introduced and assembled international pioneers of this musical genre through his International DeeJay Gigolo Records label here. Other examples of notable musicians and bands from Munich are Konstantin Wecker, Willy Astor, Spider Murphy Gang, Münchener Freiheit, Lou Bega, Megaherz, FSK, Colour Haze and Sportfreunde Stiller. Prominent literary figures worked in Munich especially during the final decades of the Kingdom of Bavaria, the so-called Prinzregentenzeit (literally "prince regent's time") under the reign of Luitpold, Prince Regent of Bavaria, a period often described as a cultural Golden Age for both Munich and Bavaria as a whole. Among them were luminaries such as Thomas Mann, Heinrich Mann, Paul Heyse, Rainer Maria Rilke, Ludwig Thoma, Fanny zu Reventlow, Oskar Panizza, Gustav Meyrink, Max Halbe, Erich Mühsam and Frank Wedekind. For a short while, even Vladimir Lenin lived in Schwabing, where he wrote and published his most important work, What Is to Be Done? Central to Schwabing's bohemian scene (although they were actually often located in the nearby Maxvorstadt quarter) were Künstlerlokale (artist's cafés) like Café Stefanie or Kabarett Simpl, whose liberal ways differed fundamentally from Munich's more traditional localities. The Simpl, which survives to this day (although with little relevance to the city's contemporary art scene), was named after Munich's famous anti-authoritarian satirical magazine Simplicissimus, founded in 1896 by Albert Langen and Thomas Theodor Heine, which quickly became an important organ of the Schwabinger Bohème. Its strikingly modern caricatures and biting satirical attacks on Wilhelmine German society were the result of countless of collaborative efforts by many of the best visual artists and writers from Munich and elsewhere. The period immediately before World War I saw continued economic and cultural prominence for the city. Thomas Mann wrote somewhat ironically in his novella Gladius Dei about this period: "München leuchtete" (literally "Munich shone"). Munich remained a centre of cultural life during the Weimar period, with figures such as Lion Feuchtwanger, Bertolt Brecht, Peter Paul Althaus, Stefan George, Ricarda Huch, Joachim Ringelnatz, Oskar Maria Graf, Annette Kolb, Ernst Toller, Hugo Ball and Klaus Mann adding to the already established big names. Karl Valentin was Germany's most important cabaret performer and comedian and is to this day well-remembered and beloved as a cultural icon of his hometown. Between 1910 and 1940, he wrote and performed in many absurdist sketches and short films that were highly influential, earning him the nickname of "Charlie Chaplin of Germany". Many of Valentin's works wouldn't be imaginable without his congenial female partner Liesl Karlstadt, who often played male characters to hilarious effect in their sketches. After World War II, Munich soon again became a focal point of the German literary scene and remains so to this day, with writers as diverse as Wolfgang Koeppen, Erich Kästner, Eugen Roth, Alfred Andersch, Elfriede Jelinek, Hans Magnus Enzensberger, Michael Ende, Franz Xaver Kroetz, Gerhard Polt, John Vincent Palatine and Patrick Süskind calling the city their home. In 1919, the Bavaria Film Studios were founded, which developed into one of Europe's biggest film studios. Famous directors like Alfred Hitchcock, Billy Wilder, Orson Welles, John Huston, Ingmar Bergman, Stanley Kubrick, Claude Chabrol, Fritz Umgelter, Rainer Werner Fassbinder, Wolfgang Petersen and Wim Wenders made films there. Among the internationally well-known films produced at the studios are The Pleasure Garden by Alfred Hitchcock, The Great Escape by John Sturges, Paths of Glory by Stanley Kubrick, Willy Wonka & the Chocolate Factory by Mel Stuart and both Das Boot and The Neverending Story by Wolfgang Petersen. To this day, Munich remains one of the centres of the German film and entertainment industry. Münchner Weißwurst ('white sausage') was invented here in 1857. It is a Munich speciality. 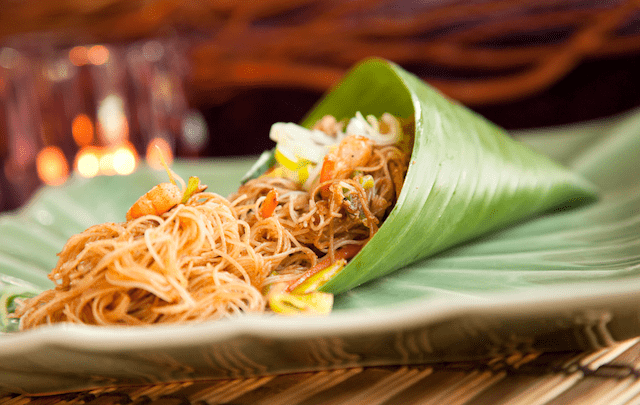 Traditionally eaten only before noon – a tradition dating to a time before refrigerators – these morsels are often served with sweet mustard and freshly baked pretzels. Munich is famous for its breweries and the Weissbier (or Weißbier / Weizenbier, wheat beer) is a speciality from Bavaria. Helles, a pale lager with a translucent gold colour is the most popular Munich beer today, although it's not old (only introduced in 1895) and is the result of a change in beer tastes. Helles has largely replaced Munich's dark beer, Dunkles, which gets its colour from burnt malt. It was the typical beer in Munich in the 19th century, but today it is more of a speciality. Starkbier is the strongest Munich beer, containing 6%–9% alcohol. It is dark amber in colour and has a heavy malty taste. It is available and popular during the Lenten Starkbierzeit (strong beer season), which begins on or before St. Joseph's Day (19 March). The beer served at Oktoberfest is a special type of Märzen beer with a higher alcohol content than regular Helles. There are countless Wirtshäuser (traditional Bavarian ale houses/restaurants) all over the city area, many of which also have small outside areas. Biergärten (beer gardens) are the most famous and popular fixtures of Munich's gastronomic landscape. They are central to the city's culture and serve as a kind of melting pot for members of all walks of life, for locals, expatriates and tourists alike. It is allowed to bring one's own food to a beer garden. There are many smaller beer gardens and around twenty major ones, providing at least one thousand seats, with four of the most famous and popular in the Englischer Garten: Chinesischer Turm (Munich's second largest beer garden with 7,000 seats), Seehaus, Hirschau and Aumeister. Among locals, connoisseurs and well-informed tourists, Augustiner-Keller, near Hauptbahnhof (central station) at Arnulfstraße, is one of the most popular beer gardens in the city, since it is the only one in which Munich's most popular beer, Augustiner, is drawn from wooden barrels. Nockherberg, Hofbräukeller (not to be confused with the Hofbräuhaus) and Löwenbräukeller are other famous beer gardens. Hirschgarten is the largest beer garden in the world, with 8,000 seats. Nightlife in Munich is located mostly in the city centre (Altstadt-Lehel) and the boroughs Maxvorstadt, Ludwigsvorstadt-Isarvorstadt, Au-Haidhausen and Schwabing. Between Sendlinger Tor and Maximiliansplatz lies the so-called Feierbanane (party banana), a roughly banana-shaped unofficial party zone spanning 1.3 kilometres (0.8 miles) along Sonnenstraße, characterised by a high concentration of clubs, bars and restaurants. In recent years, the Feierbanane has become the mainstream focus of Munich's nightlife and tends to get quite crowded, especially on weekends. It also has sparked some debate among city officials regarding alcohol-related security issues and the party zone's general impact on local residents as well as day-time businesses. Ludwigsvorstadt-Isarvorstadt's two main quarters, Gärtnerplatzviertel and Glockenbachviertel, are both considered decidedly less mainstream than most other nightlife hotspots in the city and are renowned for their many hip and laid back bars and clubs as well as for being Munich's main centres of gay culture. On warm spring or summer nights, hundreds of young people can be seen gathering at Gärtnerplatz, where they lay down in the grass to relax, talk with friends and drink beer, occupying most of the square's available space in the process. Maxvorstadt has many smaller bars that are especially popular with university students, whereas Schwabing, once Munich's first and foremost party district with legendary clubs such as Big Apple, PN, Domicile, Hot Club, Piper Club, Tiffany, Germany's first large-scale disco Blow Up and the underwater nightclub Yellow Submarine as well as many bars such as Schwabinger 7 or Schwabinger Podium, has lost much of its nightlife activity in the last decades, mainly due to gentrification and the resulting high rents. It has become the city's most coveted and expensive residential district, attracting affluent citizens with little interest in partying. Some notable nightclubs are: popular techno clubs are MMA Club (Mixed Munich Arts), Blitz Music Club, Harry Klein, Rote Sonne, Grinsekatze, Bullitt, Bahnwärter Thiel, Bob Beaman, Pimpernel, Charlie and Palais. Popular mixed music clubs are Call me Drella, Cord, Wannda Circus, Theaterfabrik, Tonhalle and Backstage. 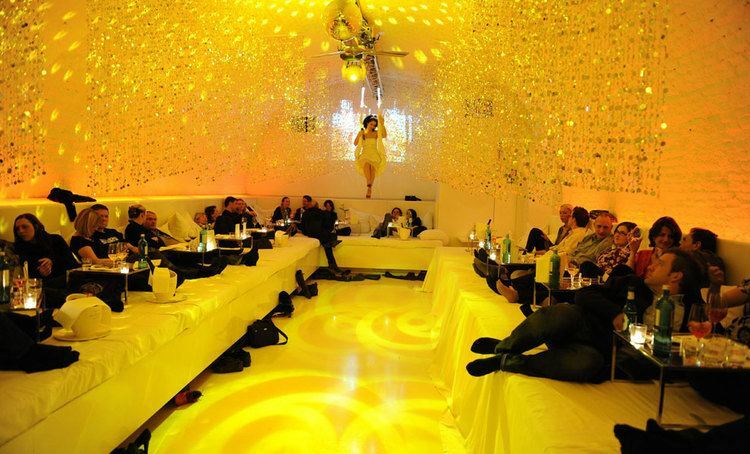 High society clubs are the P1 and Pacha Munich. Some notable bars (pubs are located all over the city) are Charles Schumann's Cocktail Bar, Havana Club, Sehnsucht, Bar Centrale, Ksar, Holy Home, Eat the Rich, Negroni, Die Goldene Bar and Bei Otto (a bavarian-style pub). Munich has the strongest economy of any German city and the lowest unemployment rate (3.0% in June 2014) of any German city of more than a million people (the others being Berlin, Hamburg and Cologne). The city is also the economic centre of southern Germany. The initiative "Neue Soziale Marktwirtschaft (INSM)" (New Social Market Economy) and the magazine WirtschaftsWoche (Business Weekly) awarded Munich the top score in its comparative survey for the third time in June 2006. Munich topped the ranking of the magazine Capital in February 2005 for the economic prospects between 2002 and 2011 in 60 German cities. Munich is a financial centre and a global city and holds the headquarters of Siemens AG (electronics), BMW (car), MAN AG (truck manufacturer, engineering), Linde (gases), Allianz (insurance), Munich Re (re-insurance), and Rohde & Schwarz (electronics). Among German cities with more than 500,000 inhabitants, purchasing power is highest in Munich (€26,648 per inhabitant) as of 2007. In 2006, Munich blue-collar workers enjoyed an average hourly wage of €18.62 (ca. $20). The breakdown by cities proper (not metropolitan areas) of Global 500 cities listed Munich in 8th position in 2009. Munich is also a centre for biotechnology, software and other service industries. Munich is also the home of the headquarters of many other large companies such as the aircraft engine manufacturer MTU Aero Engines, the injection moulding machine manufacturer Krauss-Maffei, the camera and lighting manufacturer Arri, the semiconductor firm Infineon Technologies (headquartered in the suburban town of Neubiberg), lighting giant Osram, as well as the German or European headquarters of many foreign companies such as McDonald's and Microsoft. Munich has significance as a financial centre (second only to Frankfurt), being home of HypoVereinsbank and the Bayerische Landesbank. It outranks Frankfurt though as home of insurance companies such as Allianz and Munich Re. Munich is the largest publishing city in Europe and home to Süddeutsche Zeitung, one of Germany's largest daily newspapers. The city is also the location of the programming headquarters of Germany's largest public broadcasting network, ARD, while the largest commercial network, Pro7-Sat1 Media AG, is headquartered in the suburb of Unterföhring. The headquarters of the German branch of Random House, the world's largest publishing house, and of Burda publishing group are also in Munich. Franz Josef Strauss International Airport (IATA: MUC, ICAO: EDDM) is the second-largest airport in Germany and seventh-largest in Europe after London Heathrow, Paris Charle de Gaulle, Frankfurt, Amsterdam, Madrid and Istanbul Atatürk. It is used by about 34 million passengers a year, and lies some 30 km (19 mi) north east of the city centre. It replaced the smaller Munich-Riem airport in 1992. The airport can be reached by suburban train lines S8 from the east and S1 from the west of the city. From the main railway station the journey takes 40–45 minutes. An express train will be added that will cut down travel time to 20–25 minutes with limited stops on dedicated tracks. A magnetic levitation train (called Transrapid), which was to have run at speeds of up to 400 km/h (249 mph) from the central station to the airport in a travel time of 10 minutes, had been approved, but was cancelled in March 2008 because of cost escalation and after heavy protests. Lufthansa opened its second hub at the airport when Terminal 2 was opened in 2003. München Hauptbahnhof is the main railway station in the city. It is one of the three long distance stations in Munich, the others being München Ost and München-Pasing. München Hauptbahnhof sees about 450,000 passengers a day, which puts it on par with other large stations in Germany, such as Hamburg Hauptbahnhof and Frankfurt Hauptbahnhof. It and München Ost are two of in all 21 stations in Germany classified by Deutsche Bahn as a category 1 station. The mainline station is a terminal station with 32 platforms. The subterranean S-Bahn with 2 platforms and U-Bahn stations with 6 platforms are through stations. The first Munich station was built about 800 metres to the west in 1839. A station at the current site was opened in 1849 and it has been rebuilt numerous times, including to replace the main station building, which was badly damaged during World War II. The extensive network of subway and tram lines assist and complement pedestrian movement in the city centre. The 700m-long Kaufinger Strasse, which starts near the Main train station, forms a pedestrian east-west spine that traverses almost the entire centre. Similarly, Weinstrasse leads off northwards to the Hofgarten. These major spines and many smaller streets cover an extensive area of the centre that can be enjoyed on foot and bike. The transformation of the historic area into a pedestrian priority zone enables and invites walking and biking by making these active modes of transport comfortable, safe and enjoyable. These attributes result from applying the principle of "filtered permability", which selectively restricts the number of roads that run through the centre. While certain streets are discontinuous for cars, they connect to a network of pedestrian and bike paths, which permeate the entire centre. In addition, these paths go through public squares and open spaces increasing the enjoyment of the trip (see image). The logic of filtering a mode of transport is fully expressed in a comprehensive model for laying out neighbourhoods and districts – the Fused Grid. The average amount of time people spend commuting with public transit in Munich, for example to and from work, on a weekday is 56 min. 11% of public transit riders, ride for more than 2 hours every day. The average amount of time people wait at a stop or station for public transit is 10 min, while 6% of riders wait for over 20 minutes on average every day. The average distance people usually ride in a single trip with public transit is 9.2 km, while 21% travel for over 12 km in a single direction.